Another good question. Its mid-morning, on an oven-hot day, 40 degrees Centigrade, we later discover. Not a car in sight. Way down the street, one man leaning languidly against a wall, smoking. We locate my artist friends’ home, and spend two hours outside, sitting under a shady pepper tree, feasting on tiny sticky figs, a selection of cheese and crackers, and absorbing gallons of tea. Our hosts are seemingly unfazed by the extreme heat and enthuse over the benefits of living in a tiny country town. Peace and quiet, minimal crime, spacious properties, lower cost of living, and still within a 90 minutes drive from urban fun in Cape Town. Plus a weekly farmers’ market, which truly is a local affair, and the source of today’s figgy treat. They assure us that the extreme heat is only for 6 weeks or so, and the rest of the year is very livable. I’ll take their word for it. Driving away with the aircon going full blast, we paused briefly to take pics of an extraordinarily grand church, which reminded me of a wedding cake. My attention was caught by the pillars. But heat fatigue curbed our enthusiasm for more sightseeing and happy snaps. Midway through our Open Garden viewing in Elgin, we stopped at Peregrine Farmstall for lunch. Tramping around gardens left us with an urgent need for refuelling and Peregrine was the perfect place. The Farmstall is renowned for its pies and when I’d finished my big Springbok pie, I could quite see why . It was crammed full of spicy meat, the flaky pastry was light and golden , just like you hope it will be, and seldom is! In short: the perfect pie. After lunch we wandered into the garden for a smoke break, and to my surprise, this is what I found. 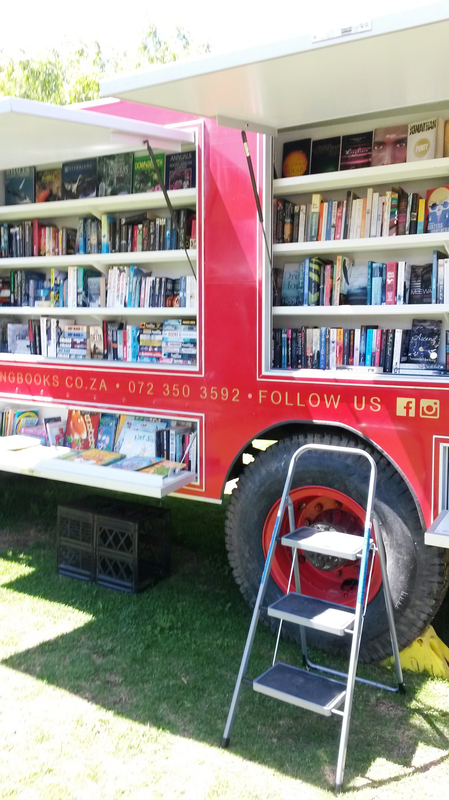 I strolled around the big vehicle , which has been retro fitted to serve as a Book Truck , a shop on wheels, stocked with current popular fiction, a large selection of kids’ books, and a small non-fiction section. I looked around for the stallholder and found Christy . There we are in the header pic. We got chatting and I discovered she loves books, particularly literary fiction and historical fiction. 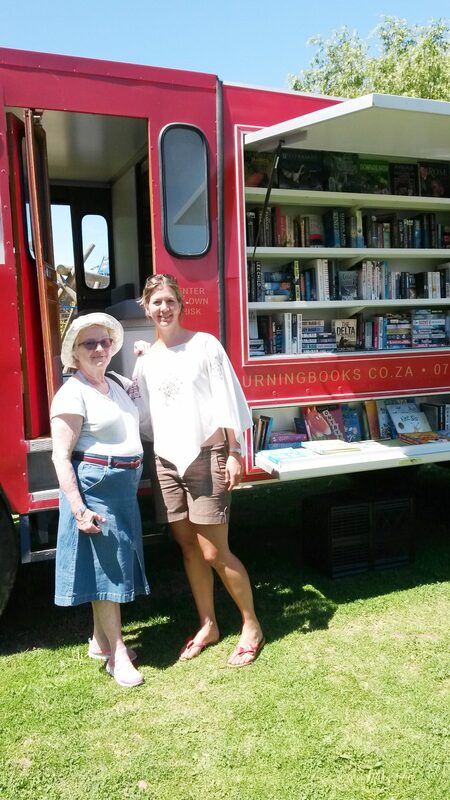 Christy told me that the mobile Burning Books project is an offshoot of her bookstore in Grabouw: Liberty Books. Would you believe she saw an ad in Gumtree for a classic imported 1955 Green Goddess fire engine – which goes to prove you can buy and sell practically anything on Gumtree! Only snag was it was situated in Dannhauser, a former coal mining town in the Northwest of Kwa Zulu Province. 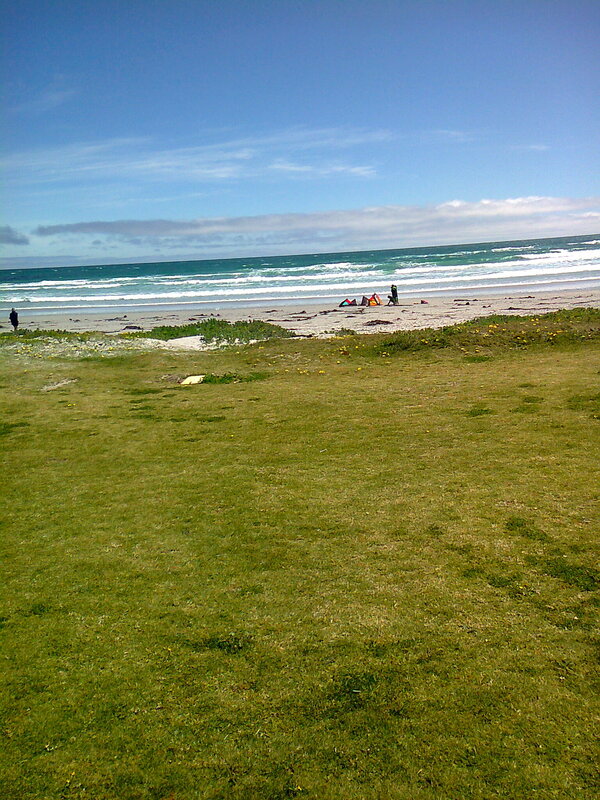 A tad under 1500 kms away from Grabouw. But, where there’s a will etc … Luckily Christy’s husband is a classic car fundi/expert and engineer, who was able to do the conversion of the truck from fire engine to bookstore. After the refit, at the end of June this year, they parked the truck in the Peregrine Farmstall garden. Due to its success, it hasn’t moved since! A noble vision, from my book fanatic’s point of view, and a delicious irony in the name, don’t you think? What booklover doesn’t fantasize about owning their own Bookstore? And then to own a happy red book truck – that’s gotta be the bright red cherry on top! * Footnote: I hesitated before adding the following grim footnote to an upbeat post, but nevertheless, it’s important current issue in our country, regarding the freedom of the Press, and the need to prevent State censorship. Not to forget protecting our citizen’s Right to Freedom of Speech. I need to connect the dots between these ideas and the present uproar in South Africa about the publication of The President’s Keepers – Those Keeping Zuma In Power And Out Of Prison (Paperback) – Jacques Pauw. His expose has rattled the cages of the corrupt and powerful, and Pauw has been threatened by our State Security Agency . Naturally the enormous publicity has caused the book to sell out. More irony. Banning books is a relic of our bad old apartheid past, and must never be tolerated again. Occasionally a much anticipated outing exceeds expectation. For years I’ve wanted to see the annual Elgin Open Gardens event and this past weekend, Nina helped make my dream come true. On Sunday we drove out to Elgin to visit the gardens on show. The weather was perfect. Sunny and hot, with just enough breeze to offset the heat. After reading the brochure giving a brief description of the 18 show gardens, we decided to limit ourselves to three gardens. As this was our first visit we weren’t sure of the distances involved, and this proved to be a wise move. Not that we traveled a huge distance overall, but driving on gravel farm roads when you don’t really know where you are going is time consuming. 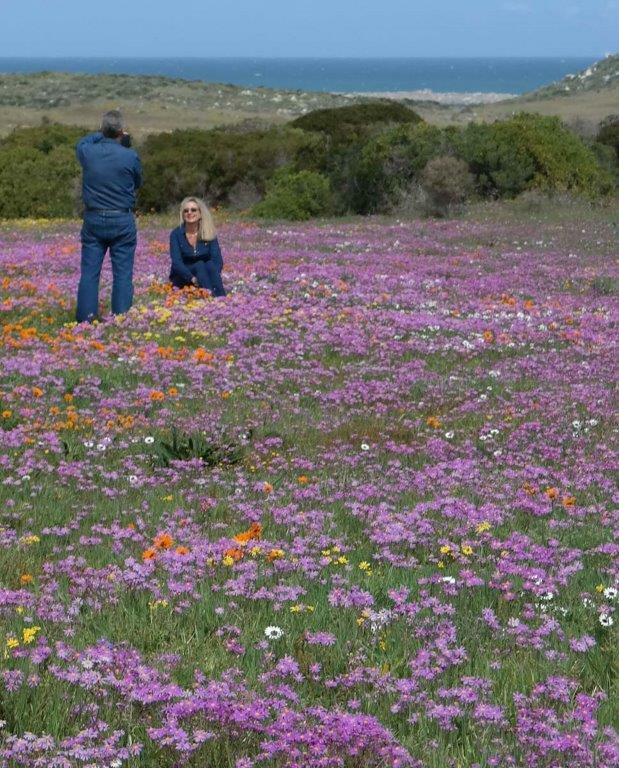 Plus half of Cape Town was also in Elgin to see the gardens, so traffic was often congested on the narrow gravel roads. Elgin is famous for its apple orchards. Other deciduous fruits are grown in the area too, and the views of farms and estates were stunning. Here is a general view of the Elgin area, en route to Highlands Road. Another general view, this time from the hilltop area of the Auld Earn garden, with a protea bush (our national flower) in the foreground. And a close-up of the protea. Jenny Simpson’s plantswoman’s garden at Auld Earn was worth the slog up and down steep hills, along challenging narrow farm roads in our modest saloon car – how we wished for a rugged 4×4, but we got there in the end. 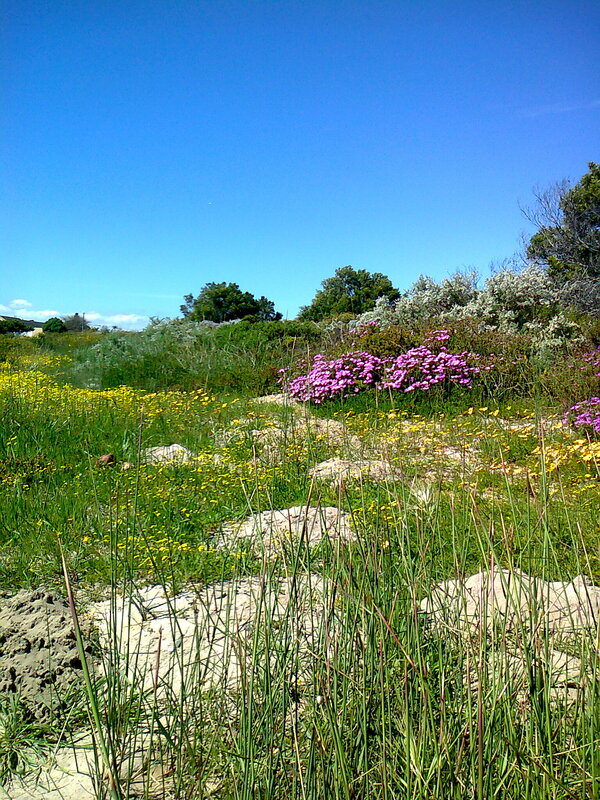 And it was worth it for the views, and the riot of mixed plantings on the property. For me the highlight of our visit to Ridgelands, Elgin Vintners on Appletiser Road, was the charming and unusual Fairy Garden. It was set in a shady corner, planted with brilliant green ground cover and tiny delicate flowers, which formed the backdrop for the miniature figurines of fairies and woodland animals peeking out from the foliage. Rambling, romantic plantsman’s garden with major collection of heritage & species roses; many rare trees & shrubs, some wild-collected, incl. rhododendrons (esp. Maddenias), serrata & wild hydrangeas, deutzias & over 70 Japanese maples; also collections of cyclamen, epimediums & lilies; woodland garden under pine. Bamboo walk. WFRS Award of Garden Excellence 2003. 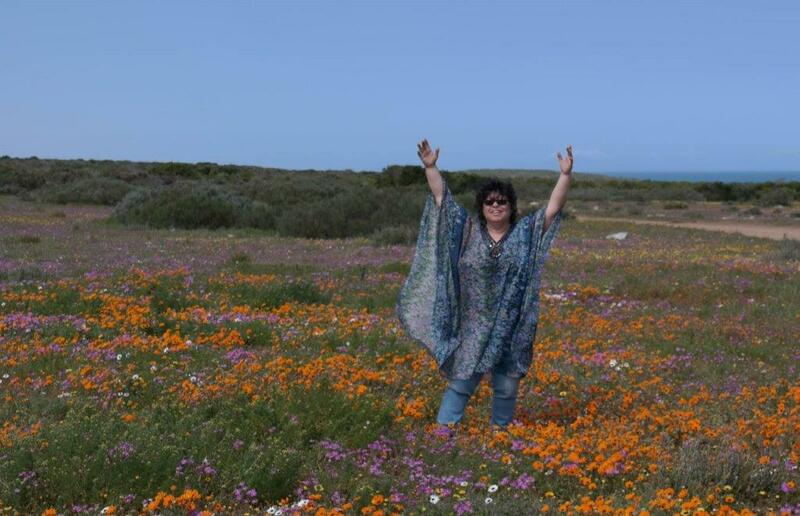 Featured in Remarkable Gardens of SA (2012); Gardens to Inspire (2013), Veld, Vlei & Rose Gardens (2011) and Old Roses: Survival & Revival in SA (2015). Next to the bamboo grove was a tiny pond, guarded by giant leaves – an accurate description, when you see me standing next to the plants, to illustrate the size of the plants. Perhaps one of my readers will know the name of the giant plants ? I’m baffled. Who hasn’t dreamed of a leafy fragrant pergola? This one has blue/purple Petrea at the base, another of my favourites, with pink roses higher up, and wisteria as a roof. Gorgeous! But my favourite was the Japanese maple tree area. I loved the delicate leaves, that etch themselves so clearly against the background , while the different coloured foliage ranging from vibrant red to pastel spring green is breathtaking. I could rave on for hours but will stop here. We’ve already diarised the date in our 2018 diaries and can’t wait to go back next year. If you live in Cape Town, the event will be open for one more weekend only, 4 and 5 November 2017. Do not miss the opportunity! All photos in this post are by Nina Ganci, and you can see more of her wonderful pics on her Facebook page: https://www.facebook.com/nina.ganci. Be sure to visit her page, as I’ve shown only a fraction of her pics . Over the years on my visits to my Durban Family (eldest daughter Helen & family) I’ve been taken to the nearby Shongweni Farmers’ Market. It was a scant 5 kms down the hill, sited on a rough, grassy hillside, inevitably wet and muddy, packed with people and their excited dogs. For some reason, Durbanites saw the Market as a great Saturday morning venue to exercise their dogs, and the ensuing tangle of dog leads, frantic barking and occasional dog fight were part of the fun. All this amongst families, toddlers, pushchairs, shopping baskets, vendors unloading their products, lost kids and runaway dogs. Happy family mayhem. I loved it. Then – oh no! the market moved. The land lease expired, and another venue had to be found. Which it was, close to the nearby Shongweni Dam. This, however, is 12 kms from Helen’s house, so I was heaved briskly out of bed at 0530 on Saturday morning and told departure was in 25 minutes. Apparently the parking situation, plus the inevitable traffic tailback on a skinny country road, has to be avoided at all costs. Fair enough. I must admit the new market is orderly, clean, vast, and offers a huge variety of merchandise. For example – huge mushrooms, being sold by an elegant vendor. Note the funky guineafowl table covering. I do love the colourful Zulu beadwork, but it’s a hell of a price nowadays. I cherish my antique strings of beads bought for virtually nothing, twenty years ago. The baskets are not beaded, as you might suppose. They are made from thin wire. 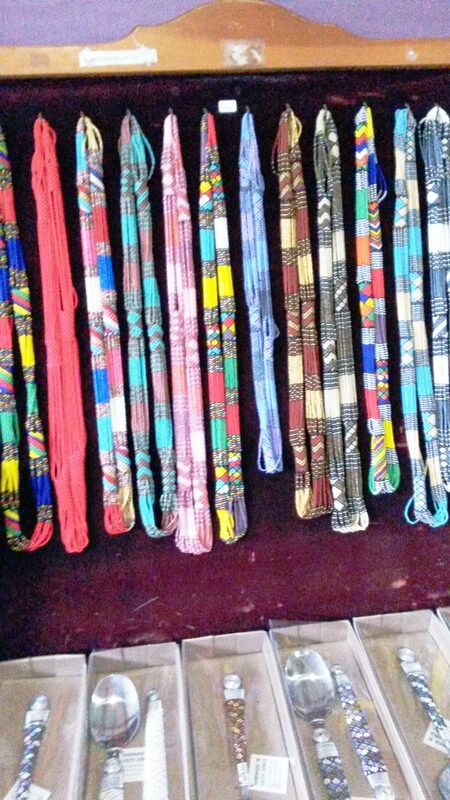 Originally weavers used to gather scraps of electric cable left behind by Telkom or Eskom. They would strip off the external plastic covering to get at the 4/5/6 strands of fine wire within, which would be colour coded. Whether the baskets are still made this way I don’t know, but it may partly account for the enormous amount of of telephone cable theft …. Roll on the introduction of fibre optic cable! 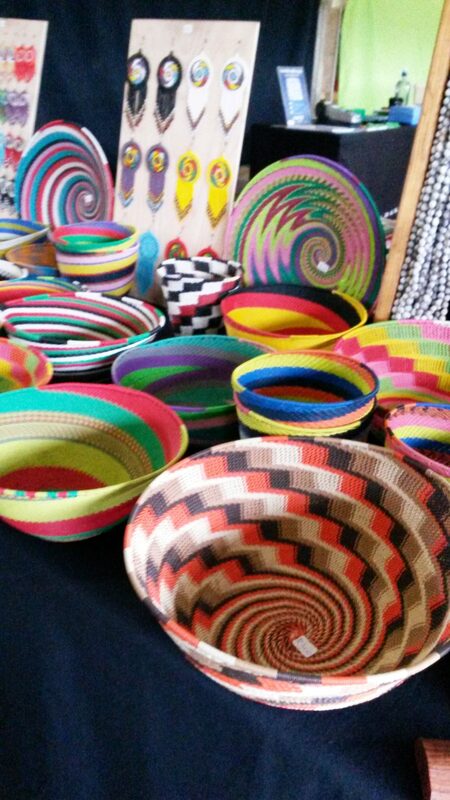 The downside will be less – or no – beautiful woven baskets. There’s food of course. What would a country market be without food? 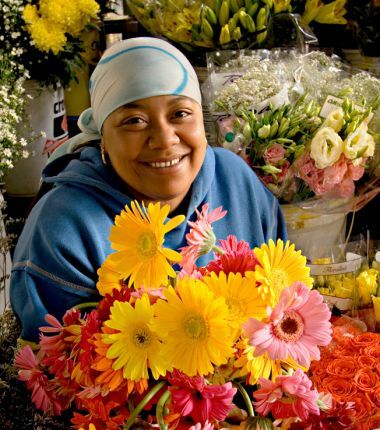 Locally made cheeses; locally grown coffee; and the ethnic bakers – Greek, German and of course, Indian, this being Kwa-Zulu Natal which has one of the biggest Indian populations outside of the Indian continent. I had my heart set on samoosas and a few Pakora*but alas! the market was so big I never managed to find my way back to the Indian food stalls. I couldn’t take pics of the foodstalls due to the crush around them. 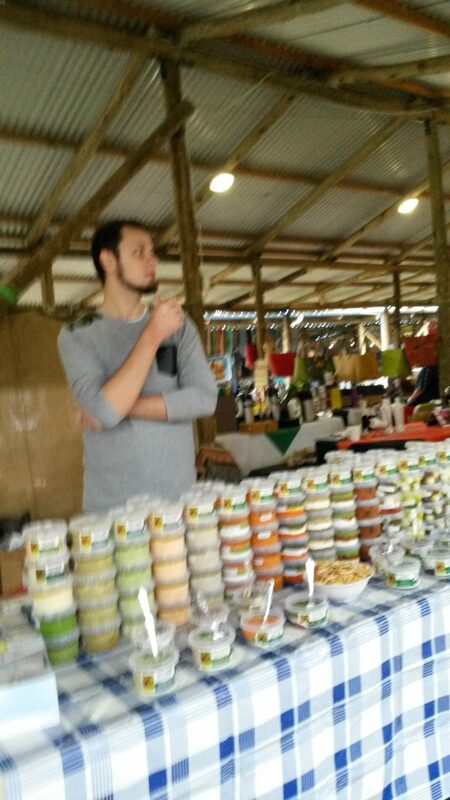 But I’m including a bad pic of the man selling pesto. Unfortunately his colourful pots of pesto didn’t come out well in the pic, but you can clearly see the smart new roofing. Which was welcome on such a drizzly, misty morning. Me & my cellphone will never win any prizes for photography. 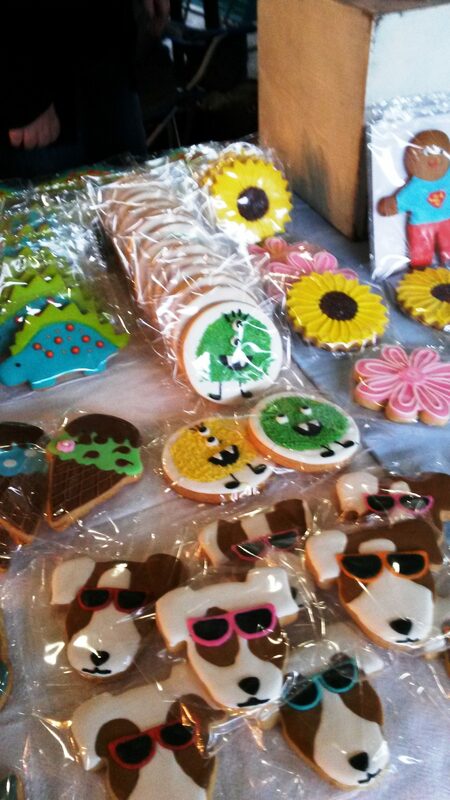 But I did catch one pic of these fun dog biscuits! I enjoyed my visit, and would love to go back another time. But the old country atmosphere has gone. The new version may well be out in the country, but now its much more organised and businesslike.On the plus side, the public loos are a great deal better. Ah well. Things change. 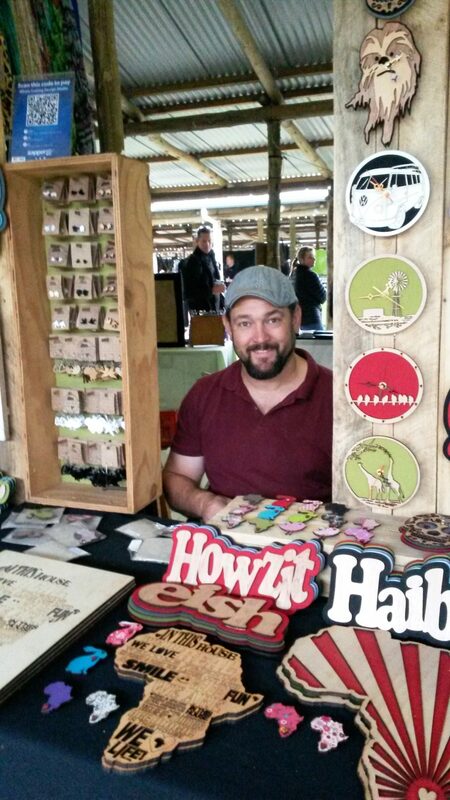 But luckily the vendor’s smiles stay the same. Howzit, Barry! *deep fried potato cake – beyond delicious finger food and death by cholesterol, but when you eat one you really don’t care. Actually, stopping at one requires superhuman willpower. Sometimes everything works in your favour. Just for once! 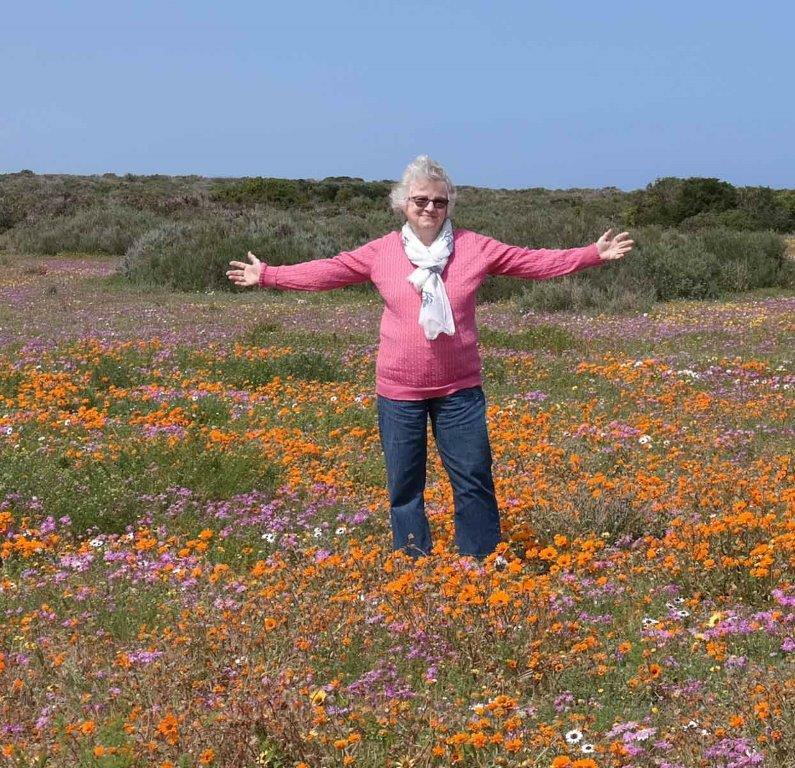 Such was the case when Nina & I visited the Postberg Flower Reserve within the West Coast National Park last week. 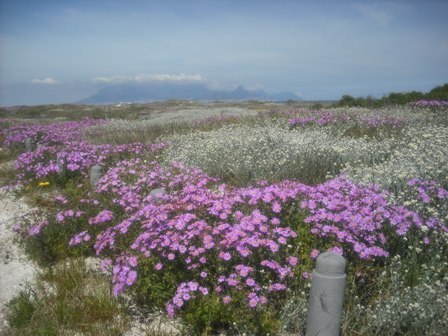 The Reserve is only open during Flower Season, in August and September, when our fabulous Spring wildflowers pop out. So I thought I’d share our lovely day with my readers. And also to show the more positive side of South Africa instead of the usual drama and disasters that blights our country. 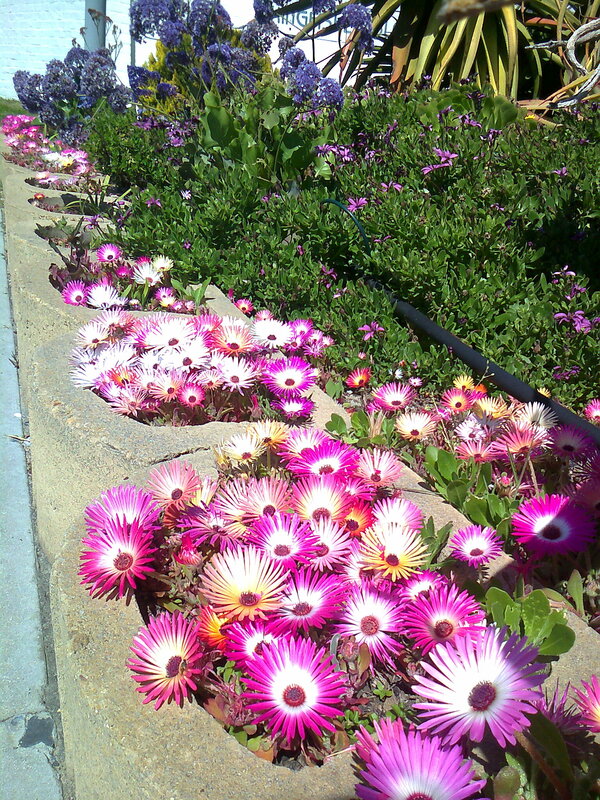 .I couldn’t resist this pic – the carpet of purple flowers was gorgeous. Thanks to the strangers who provided perspective for Nina’s pic. 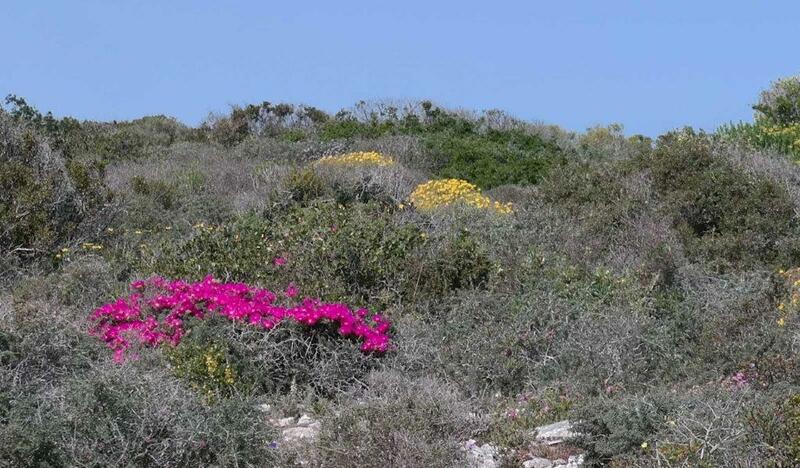 This was the one and only patch of cerise flowers we saw – a genuine shocking pink! Not so dramatic, but still beautiful. 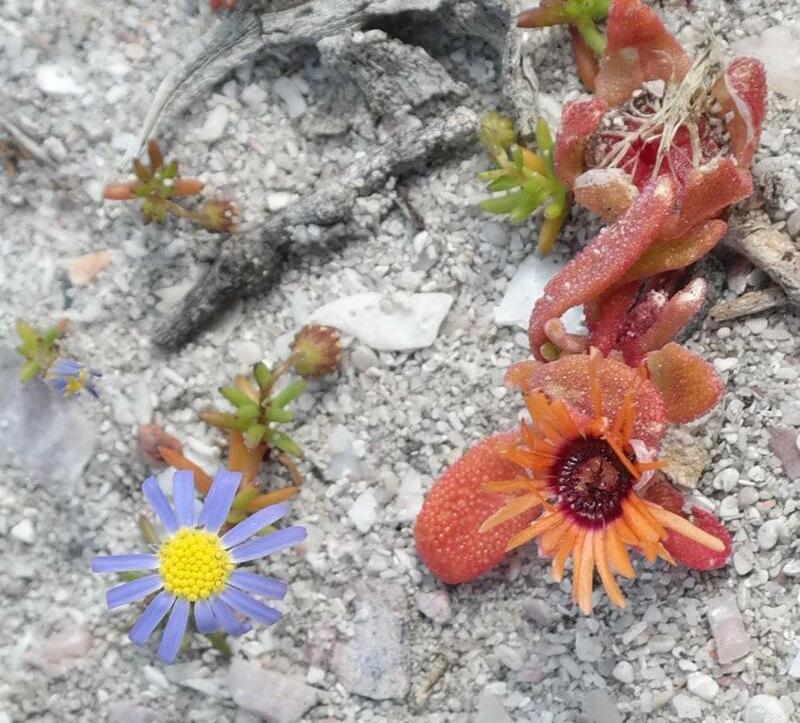 If you look carefully at the two close-ups you will notice more tiny flowers in the pics. The white background is a mixture of sand and pulverised shells. What a glorious day we had! South Africa is not an easy country to live in. The challenges are enormous, ranging from the ever present threat of crime, to rising cost of living due to the drought, to our desperate water shortage here in the Western Cape. So I am delighted to share a heart-warming story from the tiny town of Phalaborwa, situated in Limpopo Province. 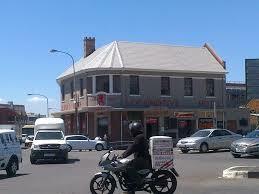 Phalaborwa is small – population approx 13 500 , close to the famous Kruger National Park . It’s bushveld terrain. Hot, dry, and thorny. Oom* Koos was old, well into his eighties. I never met the man, but always relish the story of how he opened up his garage early one morning, and was literally bowled over by a leopard charging out, desperate to get back to the bush! A true Bushveld story. How or why the leopard spent the night in Oom Koos’ garage, I don’t know. But you get the picture. My sister told me that the town was unbelievably supportive of the newly widowed woman. Apparently her car needed fixing urgently, and the local garage repaired it, but refused to charge her, saying “repairs were on the house”. Likewise, when my sister and Mrs Fourie went to the local SPAR to order plates of sandwiches and snacks for the after-funeral tea, there was the same generosity. “No charge”. Let me be clear – the family did not in any ways ask for discount or assistance, this was the spontaneous response from the SPAR Manager. “No charge – it’s on the house”. During the week that my sister was in Phalaborwa, she told me that neighbours arrived daily, with cooked meals, forfour people, three times a day! Not just the next-door neighbour, but different women on a daily basis. Now that’s true, old fashioned neighbourliness. 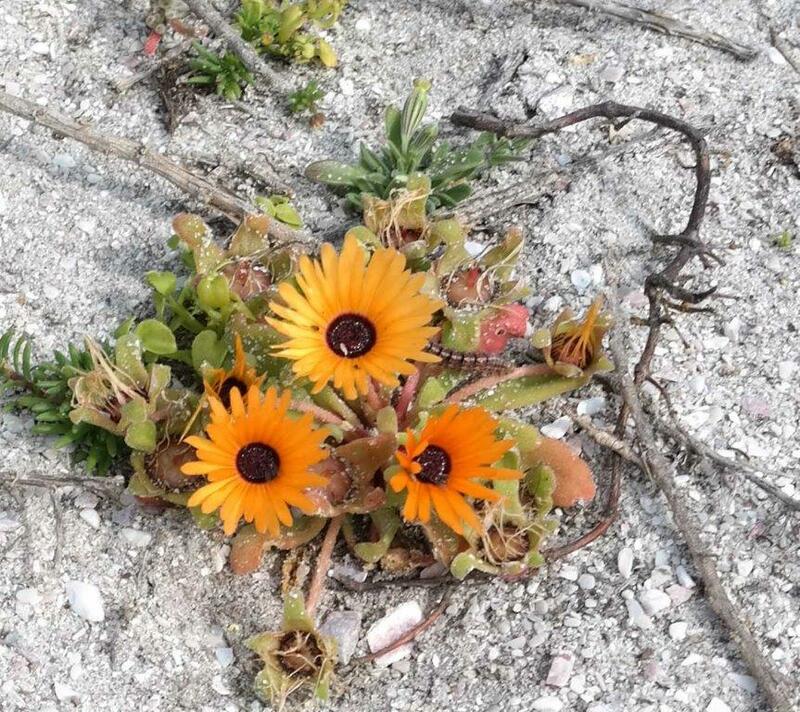 Wonderful to discover that generosity and kindness are alive and well in the far North of South Africa! Finally some good news. Let’s all celebrate the notion of neighbourliness, sharing and kindness. Our country needs it. I decided to catch Cape Town’s MyCiti bus into town, to attend the Open Book Festival, held in the CBD. After all, I have my pre-loaded bus card, so why not? Fighting city traffic and hunting for a parking never appeals to me. The bus had to be the better option. All went according to plan from my local stop, to the City terminus. What a good idea this was! Now all I had to do was find out where to catch the last bus to take me to the Festival venue at the Atholl Fugard Theatre. So I approached the nearest MyCiti official and asked which bus I should take to the District Six Museum, knowing that it was around the corner from the Fugard. I know I said District Six Museum but what the official heard was only the first part. She told me there was a District Six stop. So: I boarded. 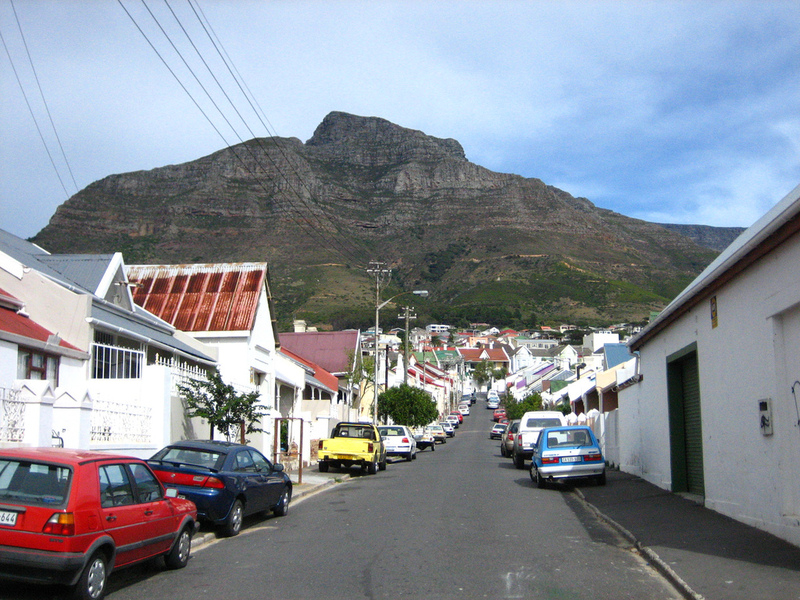 The bus ploughed up Adderley Street, into Darling Street, past the Castle, and up the hill to Cape Town Tech. At which point I had a nasty sinking feeling. I knew that my intended destination now lay half a kilometre behind me, but the bus forged on. Sure enough, there was a District Six stop, but it wasn’t where I needed to alight! By now, we were too far advanced for me to jump off and walk quickly to the theatre. Sometimes you just gotta relax, and admire the view. Which I did, for the next half hour. The higher we ascended, the more spectacular the views. First the narrow streets of Woodstock, gentrified cottages and pricey eateries; then the hodge-podge of shabby Salt River shops and backyard dwellings. Ahead were the narrow, narrow streets of Walmer Estate, which our bus driver tackled with verve , causing me to feverishly repeat my mantra. Up and round and round, to the windy heights of University Estate, a fantastic view of the harbour far below – vessels, oil rigs, cranes, and the Atlantic. Down, down we plunged at breakneck speed towards the maelstrom of Salt River traffic circle which is a crazy roundabout of trucks, bakkies, cars, motorbikes all converging on a mammoth traffic circle – I clung onto my seat grimly as our Lewis Hamilton-wannabe driver charged round the circle, back up into Salt River Main Road which I knew would ultimately lead us back to the City terminus. But not before we’d missed several cars by a whisker in Salt River, and had an altercation at the bottom end of Adderley Street, where the road narrowed down to one lane and a cheeky white Corsa thought it would nip smartly in front of our bus … The Corsa lost out, defeated by a storm of angry hooting from our driver. I think I used up my day’s allocation of adrenalin, but I loved seeing the flower sellers in Trafalgar Square, loved the cypresses and green grass of the upper mountain slopes, the harbour views, the tatty peeling charm of Salt River – and miraculous to report, I boarded another bus, got off at the correct stop, dashed up Harrington Street and made it to the venue in time. Phew! While browsing at a Charity Book Sale, I found a battered copy of A Short Walk in the Hindu Kush by Eric Newby, which I’d never read, and knowing it was a classic, I bought it. I don’t know why, but somehow I had an ingrained notion that it was a boring stuffy account by a military man, a leftover from the famous British Raj; and for this reason, I had always passed over the book on sale tables or library shelves. Was I ever mistaken! Initially the preface put me off : it’s written by Evelyn Waugh and I thought : oh dear, this is going to be about two limp wristed chaps being precious about the scenery. Wrong again. Which just goes to prove how mis-leading assumptions nearly always are. Eric Newby received a cable from his friend Hugh Carless (a career diplomat in the British Foreign Office) stationed at the time in Rio de Janeiro, pithily asking: CAN YOU TRAVEL NURISTAN JUNE? The year was 1956. Newby – somewhat oddly – was then working in the London haute couture trade. Prior to that he’d been an army officer, and prior to that had lead an adventurous life travelling around the Mediterranean, plus time sailing. In 1938 when he apprenticed aboard the Finnish windjammer Moshulu and took part in the “Grain Race” from Australia to Europe by way of Cape Horn. But a mountaineer he wasn’t; so far as I could see, no experience at all, and yet his chum Carless was inviting him to the wild mountains of the Hindu Kush, north-east of Afghanistan. I had no idea where Nuristan was, and the maps in the book were hopeless. Whilst they showed the mountain ranges which Newby climbed, they gave no clue as to the whereabouts of the peaks in Asia. I hauled out my giant Rand McNally Atlas and peered at the maps of North India, Pakistan, Afghanistan to no avail. I did find the words ‘Hindu Kush’ spread out over an area of North eastern Afghanistan, but the area then known as ‘Nuristan’ seems to have vanished. Once Carless returned to England, preparation time for the expedition was short. There was equipment and rations to buy, visas to organise, tickets to be bought. Newby’s wife accompanied them as far as Istanbul, and then reluctantly returned home – a good thing, in view of what followed. Anyway, the two would-be mountaineers managed to squeeze in a 3 day trip to the mountains in Wales, to receive some hasty training by an experienced mountaineer, but that was the extent of their technical knowledge. At this point I shook my head in disbelief. In the preface Waugh witters on about the charm of British eccentrics and gentleman explorers. He wasn’t wrong. My jaw dropped when I read that Newby had been unable to source proper mountaineering boots prior to departure, so off he went equipped with PLIMSOLLS (a.k.a. takkies) and unbelievably, wore them on the descent. His boots were mailed to him and never reached him. Naturally he suffers terribly from blisters due to the unsuitable boots he does manage to find. When I think of modern expedition equipment, state of the art clothing and kit, plus NASA space-style dehydrated foods – these two survived on tinned food, chiefly Irish stew, and on one occasions dined off a one pound tin of strawberry jam, and a tinned baked apple pudding. The mind reels. Finding provisions en route was difficult. 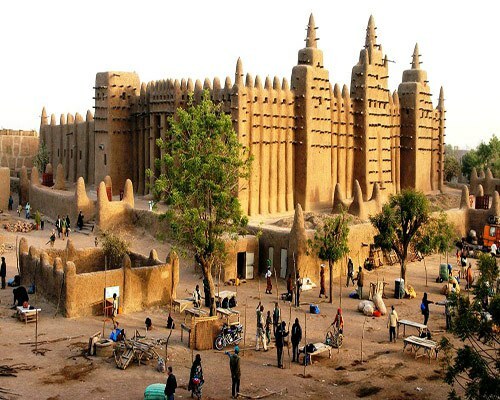 The area was sparsely populated, and the locals lived on very little, without much surplus to offer travellers. And when the mountaineers did eat local food, the inevitable result was severe diahorrea. Carless’ old and trusted cook was to have accompanied them up the mountain, but he only remained with the expedition for a short while, due to a commitment to his existing employer. Thereafter catering was a hit and miss affair. Mostly miss. Carless was completely disinterested in rations, food or cooking. In the event they didn’t succeed in reaching their goal, the summit of Mt Samir. 700 feet below the summit of 19 000-plus feet , they took the wise decision to descend, whilst they had sufficient light. And even then, it was perilous. So near, and yet so far. En route they encountered wild tribesmen, bandits, mullahs, primitive shepherds none of whom could speak the Farsi (Persian) or Urdu spoken by the climbers. All the local inhabitants spoke ancient tribal dialects, and the tale is sprinkled with historical graffiti about Timur (Tamerlane) and Alexander the Great. This mind you, only 70 years ago! Nuristan at that time was beyond remote, and I suspect that the passing of time has not brought much by way of modernisation to the Hindu Kush. When the climbers were not traversing rocky slopes or treacherous windy roads bordered by precipices, they were descending the cliffs to river valleys, watered by icy rivers , bordered by willow trees. Apricot and mulberry trees provided fruit, wheat was grown. There were cattle, also flocks of sheep. The Nuristanis were renowned makers of butter, and bartered quantities of butter for other goods, but this meant their men had to cross mighty mountain passes, carrying enormous goatskin bags of butter to trade. Reading Newby’s account is like taking a giant step back in time, maybe as distant as the Middle Ages, so far as his account of the land and its peoples is concerned. As for it being an account of an expedition, a journey of exploration, well, I’m not so sure. Part of the blurb on the back jacket says : Impossible to read this book without laughing aloud … the funniest travel book I have ever read. (The Observer). I didn’t find the book hugely funny – most of the time I was aghast at their foolhardiness, their unpreparedness! I’m definitely keeping the book, I like the fact that is battered and worn – kind of like the two men who walked over the Afghanistan Mountains. I realize I should have posted this account prior to showing off my Nokia pics in my previous post, but I was so excited about my pics, I forgot about the journey and the sights along the way. But not to worry – you may join me now if you wish, alas! no Nokia pics to accompany the text. En route to Underberg, I hadn’t thought of using the camera function on my phone. Because I dislike driving – especially on roads decorated with stray kamikaze goats, who are horribly speedy as they dash across the narrow tarmac; browsing cattle on the verges, wobbly cyclists, over-laden trucks, and huge SAPPI trucks loaded with timber – no thanks, I’d rather pay and take the NUD Shuttle to Underberg. Much more soothing. You can sit in the back and enjoy the scenery. We whisked along past surprisingly full rivers, but the dry brown hills rising from the rivers were what I’d expected during winter-time. In between the goats on the road I saw the occasional skinny sheep with dirty, tatty wool, which was another surprise. Kwa-Zulu Natal is not really sheep country, the Western Cape is the area for sheep, millions of them. I enjoyed looking at the small farmsteads and houses dotted on the hillsides. Some were the old, traditional round huts with thatched roofs. Others, presumably more modern, were small rectangular houses, many with interesting paint colours notably a deep violet that wouldn’t have looked out of place in a bordello! I can only assume the violet paint was a real bargain on a sale. Government buildings sported new cream paint, with a vivid sky blue trim to prevent mud splashes during the summer rains. The painter must have been an Ndebele, because the borders had been given a traditional geometric pattern effect. Outside Bulwer I saw scores of school children along the dusty roadside, exiting from school buses – all remarkably spruce in navy track-suits, with a white chevron and gold trim, no hanging shirt-tails or rebellious add-ons. In view of the reports we often hear about rural poverty, this was a welcome sight. We passed big timber plantations. The spruce needles hang in pretty fringes from the branches, reminiscent of Japanese scenes on scrolls and paintings. The massive timber trucks are neither artistic nor pleasing, as they crawl up the hills at nought miles per hour, belching exhaust fumes, and preventing traffic from passing. There are few stretches of flat road in this hilly terrain. Other heavy duty trucks clog up the roads, carrying agricultural supplies and products, building materials, and who knows what? Impossible to tell. Surprisingly, I saw hardly any buses or taxis, even deep into the rural areas, where few people own private cars. But Underberg was full of the ubiquitous bakkies and 4x4s, driven by village locals, and also visitors en route to the resorts and parks of the nearby Drakensburg mountains. As we left Underberg the horizon was decorated with mountain peaks in a soft blue – a series of ranked cut-outs at the edge of the world. Dharmagiri Hermitage lies in the foothills of the Drakensberg, on its own mountain, Bamboo Mountain. On my first night at DG I looked up through the cold, clear sky and marvelled at the stars so very many, and so very bright. Such a contrast to the city night skies down on the coast. How wonderful to be standing outside at night, gazing up at the stars!